I still have a cold this week, but it seems to be clearing up a bit - just in time for Josie to come down with another cold. If I'm lucky, maybe she'll give it back to me once I'm better. Sleep is still a miserable exercise for me right now. I still hate my pregnancy pillow, although I was able to actually keep it in place all night once in the last week (every other night I chucked it out of bed in my sleep), and I then woke up in the morning with a clenched (and sore) jaw and a backache. So not sleeping on my back is not going well, nor is sleeping in general. My mood has really deteriorated the last couple of weeks when my sleep got even worse, in case that's not obvious. 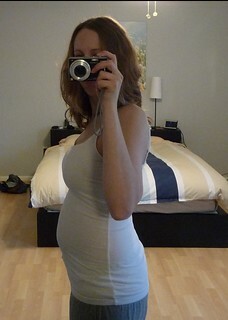 New baby continues to be quite active - I still can't feel kicking more than a handful of times a day, but it was reassuring last week when I was at my midwife appointment and we were able to hear the baby moving around on the doppler even though I wasn't feeling a thing at the time. But this week I was able to feel new baby kicking from the outside again, and the feisty little thing apparently thought my belt was too tight since it kept kicking right where my belt was until I loosened it. 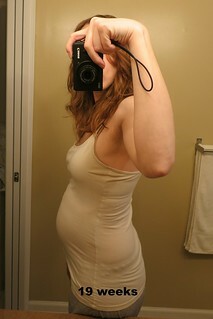 I also had a couple Braxton-Hicks contractions this week, which completely freaked me out. I only had them during the last week of my pregnancy with Josie (and didn't even realize what they were at the time since they only lasted about 10 seconds each), and somehow forgot all about them this time around. So I was convinced I was going into labor, since I had a pretty active day (long walk, moving stuff around), and so I drank a bottle of water and laid down for an hour or so. A few quick minutes of internet research later (and no further contractions), and I realized what was going on and was able to calm down. 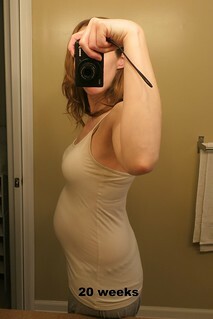 Here are my comparison pictures for this week... and since the 19-week to 20-week comparison looks essentially the same, I threw in my 20-week picture from Josie too.